Does religion promote better societies? This post was copy/pasted my blog entry here: Does religion promote better societies? Many christians subscribe to the idea that religion promotes better, healthier and safer societies. Conversely, they often believe that a lack of religion leads to weaker, unsafer societies. Are they justified in thinking this? I put some cerebral thought into this question a few years back and came to a different conclusion. It's very easy to look in the middle-eastern countries and see cultures deeply rooted in religion with deep social problems. Is there a direct correlation to the high numbers of individuals with fundamentalist beliefs within those societies and the problems seen? They definitely have problems, but is it religion? On the surface, one may conclude that this must be because of other issues or because of the particulars of the religions they follow. Is it religion in general or just their religion? Is it something else? In order for something to be a theory, it must be falsifiable and it must predict. With the theory that levels of religiosity directly correlates to social problems within countries (a prediction) , one should be able to find similarly high social problems anywhere there are high levels of religiosity, regardless of the religion (a test). My theory predicts that even a developed, prosperous and democratic country should still exhibit high levels of social issues if there is a high level of religiosity in the general population. Where to look then? The obvious place, the United States. The US fits the criteria very well for an objective test of the theory. It doesn't have many of the other problems that could be effecting many of the middle-eastern countries; problems such as recent wars (or ongoing) on their soil, aggressive neighboring countries, political systems and instability, weaker personal liberties, lower standards of living, lower levels of education, etc. So how does the US rank in terms of social problems when compared to other similar democratic, wealthy countries that are less religious? We all hear of the high murder rates, rapes, teenage pregnancy, etc. in the US, but Americans tend to think this is normal and many christians tend to blame it on a lack of religiosity in the general population - never considering that the US is actually one of the most religious countries on the planet. When contrasting the levels of religiosity in the US to other countries such as France, UK, Canada and many others, the numbers don't make sense by the claims of the fundamentalists. By the theories of the christian fundamentalist in the US, the US should rank higher for social progress but it consistently ranks lower then all similar countries with less religious populations. My conclusion was that the US does exhibit many of the social issues that accompany high levels of religiosity, but this was not a full out study on the problem, just my own investigation and comparison of some general statistics from several countries. Visit my blog on Atheism: Cerebral Thinking for some more food for intelligent thought. The more religious a society is, the worse it tends to be. Very interesting stuff. I've got some hunches I'll throw out there as far as possible explanations for the phenomenon. First off, I'd like to suggest that it would be more helpful to not throw all religions together in one lump like this. There is a dramatic differentiation between religions, and even between denominations within the same religion (like Christianity). It would be more helpful to find the particular strains of religion that exercise the most influence on the countries in question, because these different strains can have some extremely different worldviews. For example, I think that one particularly harmful strain of Christianity that has exercised great influence in America is Puritanism and its taboos against the physical nature and its pleasures. These same taboos can be found in Islam. America is particularly influenced by a strain of Puritanism that has never been as predominate in Europe. A basic characteristic of Puritanism is defining spirituality by what you should NOT do rather than by what you should do. This leads to the kind of legalism that the teachings of Christ and the new covenant went specifically against. An interesting case study could be done, I think, on the use of alcohol in America vis a vis Europe. All my life I grew up with the Baptist taboo on alcohol. I noticed that the kids who would drink in high school did not drink for the sake of drinking, but for the sake of getting drunk. Why? Because of the taboo, the immediately associate alcohol with drunkenness. That is why you drink. Period. Also, the taboo sets up a forbidden boundary that youth find exciting to violate. In contrast, in Europe alcohol is basically as normal of a thing as eating desert or drinking coffee or something. There is no social taboo. In fact, the churches there will even serve alcohol at church events. I would imagine that this same basic principle could be applied to the high statistics of bad stuff found in these religious countries. Also, an interesting contrast I have seen between America and Europe is that Europe (at least the little of it I've seen in England and Ireland and heard of it from my European friends) seems to be a much more socially conscious place, and my hunch is that that has nothing to do with religion but with geography. In America, autonomy is king. Emphasis is on the individual: individual safety, affluence, etc. Except for in the major metropolitan areas, our cities are flat and spread out which creates much more privacy and individuality. The unoccupied spaces of America allowed this new, modern, autonomously-oriented American civilization to build itself in such a way that they are spread apart from each other. Instead of riding busses or walking, people drive their cars everywhere (even when gas is astronomical). The futurist Faith Popcorn calls this sort of autonomous trend "cacooning." You leave your workplace, and then cacoon yourself into your car, and then cacoon into your home, lock the doors, get on the internet. All in all, I guess what I'm saying is that this greater social consciousness built in by necessity to Europeans probably plays a dramatic role in why these social problems might not be as pronounced there when compared to America. Sorry for the long post... I get going and I can't stop. Thanks for sharing! Ockham's Razor is only as sharp as you are. “In general, higher rates of belief in and worship of a creator correlate with higher rates of homicide, juvenile and early adult mortality, STD infection rates, teen pregnancy and abortion in the prosperous democracies. The United States is almost always the most dysfunctional of the developing democracies, sometimes spectacularly so.” Gregory S. Paul, social scientist and author of ‘Cross-National Correlations of Quantifiable Societal Health with Popular Religiosity and Secularism in the Prosperous Democracies’ published in Journal of Religion & Society. My theory predicts that even a developed, prosperous and democratic country should still exhibit high levels of social issues if there is a high level of religiosity in the general population. A theory this social scientist Gregory Paul statistically proves in his sociological study even down to the 'literal' context of the unique qualifying words for democracies you use in describing your theory in relating it to 'developed, prosperous and democratic country'. There’s a reference on skepticfiles.org to a study of Sing Sing inmates executed for murder during a 10 year span. It cites 97% of inmates executed for murder in a 10 year span were adherents to monotheism [Jewish, Christian and Muslim combined] and only a 1/3 of 1% were atheists. US Federal Bureau of Prisons statistics on known religious affiliations in 1997 show 90.9% of all inmates in federal prisons are adherents of a monotheistic religion [Christian, Jewish or Muslim] with just 0.209% prison adherents of atheism. This shows a reverse correlation when compared to the general population. The per capita percentage of Christians [77%] in the general population produces a 6% higher per capita percentage of Christians [83%] in prison. The opposite is true for atheists by a wide margin. There’s a significantly lower percentage of atheist offenders in US Federal prisons [0.21%] than the per capita percentage of atheists [anywhere from 4%-14% averaging 9%] found in the general population. This proves that a Christian is far more likely to commit and be convicted of a crime in America than an atheist. At RoadToPeace.org on ‘Monotheism and Violence’, you’ll find the above most relevant table 4 from a survey that ranks belief systems by violent events occurring per each million adherents of Monotheism, Eastern Religions and Atheism. The table is ‘normalized’ using a rank order for Atheism equaling one. There is a whopping 2738% greater occurence of violent events by adherents to monotheism than the 1.3 average of violent events per million by adherents to eastern religions and Atheism. It is all too evident from religious wars throughout history, and most notably from various monotheistic wars now being fought in the middle-east, the future for all humanity depends on an immediate cure for the pandemic level of a faith-based psychosis still afflicting so much of the world’s populace in the 21st century. Monotheism is singularly the most destructive force in the history of civilization. To cure this faith-based psychosis threatening our very existence, we, as freethinkers, rationalists, non-theists, or any nomenclature for those utilizing reason without regard to authority to guide their lives, must understand it in a historical, philosophical and especially a social and behavioral science context to even be able to help cure it. As much as it is against our very nature as freethinkers to unite in a cause for any sort of ‘mass movement,’ we must do so now more than ever in hopes of greatly reducing the continual threat to life and the planet this pandemic level of faith-based psychosis represents to us all. Directly following this table 4 from ‘Monotheism and Violence’ at RoadToPeace.org, the authors ask a most relevant question in “Why the disconnect? Could it be that Monotheism itself is an expression of the Authoritarian Personality?” This is a question I've been trying to answer to the affirmative since Bush 'took' office with his cabel of authoritarian far right wing Xtian extremists at the start of the 21st century by showing the RWA [Right Wing Authoritarian] personality as an integral part of and essential to monotheist beliefs founded in faith. “True believers are not intent on bolstering and advancing a cherished self, but are those craving to be rid of unwanted self. They are followers, not because of a desire for self-advancement, but because it can satisfy their passion for self-renunciation! They are eternally incomplete and eternally insecure.” Eric Hoffer; Author of ‘The True Believer’ and winner of the Presidential Medal of Freedom. We can take a trip back in time to Hellenistic philosopophy to find two of the world's most well known philosophers correctly identifying the true believer’s [right wing] authoritarian personaliy in different terms. The battle between the life philosophies of Aristotle and Plato still rages today: The 'thinker vs the believer,' the 'rational vs the faith based,' or the Aristotelian vs the Platonic. I'll sum it up for the MTV Attention Deficit Generation out there in SAT, and LSAT format with: Aristotle is to Naturalism as Plato is to Dualism; Unification of mind and body is to Naturalism as Separation of 'soul' and body is to Dualism; Evolution is to Naturalism as Creationism is to Dualism; Naturalism is to Atheism as Dualism is to Monotheism; Reason, Science and Rationalist is to Aristotle as Faith, Religion and 'Believer' is to Plato. The age old debate looms evident with Logic founded by Aristotle as Christianity found its basis in Plato. What Aristotle argued in what is now called Aristotelian thought, or the rational, is that the 'thinker' knows that reason is the light that will show them the way in life. Plato argued in what is called Platonic thought that the individual finds their way in life through the 'special' endowed wisdom of a very few 'humans' on earth, both dead and alive, that will show them the way in life. What that really means is that the Platonic type 'believes' others to have the wisdom to show them their way in life. That others will provide them 'reason' for their own existence. The 'Believer' is externally directed, where the rational, or the Aristotelian based thinker is internally directed. What these two modes of thought in philosophy present from Aristotle and Plato are two distinct, separate, and different overall visions for human attitude toward life and the purpose of life. Two Primary Modes of two very different thought processes in relating and reacting to life experience - in learning, interacting, and experiencing everything that life does or does not offer. With each human in the process of being human reacting primarily in one mode of thought or the other as they experience life. Each life philosophy a preferential mode of though and reaction to the world around us as humans being human with each providing very different responses. Plato's Republic is considered to be "a handbook for aspiring dictators" by many scholars. Nietzsche has a famous dictum about the auhtoritarian roots of Platonic thought in "Christianity is Platonism for the masses". Here's an excellent article relating Platonic thought as directly responsible for the problems America faces today in "Avoiding Plato's Republic in America: Anarchy is the Only Hope". There is no doubt Plato's view of Human nature is Authoritarian and Christianity finds its roots in Platonism. Rabbinic Judaism and Christianity both find their basis in a Platonic ideology from attempting to prescribe how man can transcend from our physical existence to the infinite. In other words, how one must worship God. How do Aristotle and Plato's Helinistic life philosphies relate to what I identify as a Right Wing Authoritarian [RWA] Personality DISORDER rather than type? Christianity, with its philosophical roots in Platonism, is a form of Right Wing Authoritarianism (RWA). Historical Christianity is a classic example of RWA thought. RWA personalities are damaged by their life experience due to the ruthless way they organize human societies - which is also why the RWA personality is as much a disorder as it is a personality 'type'. It's a personality disorder that leads to a belief that other human beings are extremely dangerous, which is a learned belief. Social Dominance Orientation (SDO) and Right Wing Authoritarianism (RWA) are well-studied variables in attitudes to measure intergroup dominance and submission to authority, respectively. They are important, and fairly recent developments in the study of psychology, sociology and behavioral science going back to the end of World War II. Then a new field in Behavioral Science to hopefully explain and identify how and why Hitler gained so much support from the German people. They are personality variables perhaps even more relevant now than in Hitler’s Germany to understand the mass psychosis affecting the 10s of millions of muddled minds in the huddled masses of America today. SDO is associated with racism, warmongering (Pratto, Sidanius, Stallworth & Malle, 1994) and attitudes about women’s rights (Heaven, 1999). Whereas RWA is associated with xenophobia, homophobia and sexism (Altemeyer, 1998; Duckitt, 2001). SDO and RWA together are described as ‘two sides of the same coin’ because the measures are interrelated and non-overlapping as unique predictors of prejudiced attitudes (Altemeyer, 1998). Both SDO and RWA are ‘ideological attitude’ factors in personality. The authoritarian personality is characterized as conventional, submissive to authority, and aggressive toward deviants and outsiders (Altemeyer, 1981). Most freethinkers can easily recognize this RWA personality that shares similar characteristics or ‘traits’ with the ‘true believer’ from: excessive conformity; submissiveness to authority; intolerance; insecurity; superstition and; ridged, stereotyped thought patterns. All the preceeding characteristics are identified by German sociologist and philosopher, Theodor W. Adorno as traits of an Authoritarian Personality. Members of large authoritarian groups, regardless if religious, political or fraternal, are to a large degree, externally directed. Their immense need for external direction drives them to join mass movements by the droves to follow a charismatic leader. As long as dependent minded followers believe, their leader can get away with anything. A common hatred, enemy, or devil is essential to the success of both their leaders and their groups characterized by an ‘us versus them’ attitude of bigotry, and hate towards outsiders. Their internal dependence on external group thought and direction is a primary reason they’ve been so successful at imposing authoritarian rule throughout history using a few select faith-based leaders. The most extreme racist hate groups in America like the KKK, Aryan Nation and others, all have a Christian identity that supercedes their bigoted racial supremacy. Right wing political groups in America also have a primary Christian identity that supercedes their underlying right wing political goals. True believers seem to almost always be raised in an authoritarian environments. They have typically been taught ‘what’ to think, rather than ‘how’ to think from birth. Instead of a philosophy based in reason to guide them, or show them the path, they rely on others, typically authoritarian figures, both alive and dead, to direct their thoughts and actions taken in life. Like all that suffer from deeper levels of psychosis, they refuse to acknowledge they even have a mental disorder where contact with reality has been completely lost or at best, highly distorted. Research shows authoritarian personalities are hierarchical, conventional, and intolerant. Religion depends and demands on intolerance and bigotry because of its prime requirement for obstinate and unreasoning attachment to it’s beliefs unfounded in fact. Intolerance is needed for indoctrination and continued adherence to religious dogma. If the believer is not bigoted, the believer does not remain a devout member. Altemeyer’s research in particular reveals the personality of a RWA [Right Wing Authoritarian] individual to be highly dependent upon strong group demands for high ideological conformity. Altemeyer’s RWA scale measures three reliable facets of authoritarianism: conventionalism, or rigid conformity to group norms; submission to higher status individuals; and aggression toward out-groups and unconventional group members. All ideal measures of individual and group norms so necessary to religion comprised of its ‘RWA true believer personalities’ of religious adherents. Eigenberger (1998) hypothesized that authoritarian behavior results from fears associated with social exclusion and group dissolution, which were genuine threats to survival during much of our evolutionary past as homo sapiens. Monotheism gives homo sapiens an ultimatum based on a foundation of fear. The Bible God will punish anyone who doesn’t reach a particular and proper conclusion. There is nothing free about that type of will. Unlike freethinkers, religious adherents simplay cannot make objective conclusions because the use of fear tactics defiles any level of ‘freedom’ and independence in their thought process. Former psychotherapist, and NLP [Neuro Linquistic Programming] Trainer Thom Hartmann suggests in ‘Cheney Speaks to the Reptile Brain’ that the Bushies are indeed trying to directly ‘relate’ to the ‘less than human’ survival brain of the susceptible populace in America. True believers of imaginary skygods are the most highly susceptible to Bushite fear tactics. “The reptile brain has a singular focus: survival. It doesn’t think in abstract terms, and doesn’t feel complex emotions. Instead, it’s responsible for fight-or-flight, hunger and fear, attack or run.” The fear-mongering Bushites succesfuly relate to the very same less than human ‘beast brain’, as I call it, that predominantly motivates the RWA true believer fight-or-flight emotions. In groups of non-human primates [perhaps also not so ironically meaning ‘a senior clergyman and dignitary’], just as in ‘less than human’ RWA true believer groups, most primates, particularly males, are preoccupied with their concerns over dominant status, group affiliation and group integrity. Anything perceived as a threat to their place in the primate group is a powerful source of fear and apprehension just as it is for their allegedly homo sapien or ‘less than human’, RWA true believer counterparts. Non-human primates exhibit extreme xenophobia (fear of the strange) in encounters with different groups of the same species, just as the alleged homo sapien true believer primates do in expressing extreme xenophobia in their RWA personalities. Studies of proto-cultural transmission in Japanese macaques [Short-tailed monkey of rocky regions of Asia and Africa] show that the females and their young acquire new innovations and concepts, but their hierarchically ruled adult males are virtually closed to such new experiences. 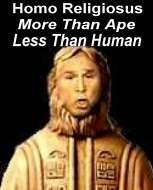 The xenophobic, closed-minded, control-driven non-human primate male, just like its RWA true believer counterpart, is ready to submit to a dominant and equally ready to oppress subordinates. A defining factor between the true believer and the freethinker in human populations of all societies around the world appears to be distinguished by the each individual’s subsequent ability or inability to utilize the most rudimentary levels of reason. These same RWA true believer personalities exhibiting substandard abilities in reasoning flock to each other from finding emotional comfort in cults, mass movements, and large groups characterized by dependent group thought. All cults are composed of true believers with RWA personalities. They are the joiners and the followers who are always looking for authority, answers, meaning, guidance and enlightenment from outside themselves. Most any freethinker that’s ever tried to ‘debate’ the RWA true believer personality, even the rare atheist or agnostic RWA personality, immediately sees their lesser ability to effectively utilize reason or critical thinking. They rarely relate to or even address logic, rational thinking or ‘reason’ at all. Instead the RWA personality relates to their feelings and emotions instead of the facts. I’ve yet to ‘debate’ any Right Winger, regardless if a skygod believer or not, whose entire argument isn’t comprised of almost pure fallacy from start to finish. “What scares right wingers to the bone? Freedom. Free speech. Free thoughts. Free people. Why? They feel insecure in an uncertain universe. Right wingers crave order and simplicity, and will impose these things where they are not and should never be. Right wingers are theocrats and pseudo-libertarian Social Darwinists or even fascists who embrace authority and power over the individual. Dissent threatens right wingers’ fragile sense of security. Right wingers’ reverence for authority makes them believe whatever their superiors tell them to believe. Their fear and insecurity make them shun the unknown and prevents them from questioning tradition or thinking in new ways. I’d say right wingers demand that everyone think whatever they think but right wingers don’t think. They listen and obey. Free thinking threatens right wingers. It weakens their precarious hold on their make-believe world. Right wingers dislike education and they loath science. New information and the uncertainty fostered by the free flow of fresh thinking undermine their sense of stability. They are still in denial about evolution! Right wingers believe superstitions and embrace propaganda. They ignore information that challenges their prejudices and preconceptions. They therefore lack judgment and eschew conception. Right wingers believe in absurd contradictions, impervious to logic or education. Right wingers flock to cults of personality. Right wingers care about their feelings, not facts. Facts must either support rigid right wing beliefs, or else the facts must be wrong. Those who present facts which contradict right wing dogma must be evil. Right wingers support idiotic, even fatal policies because they place nonsense over knowledge. They believe using condoms increases the chance of pregnancy and STDs. They think racism is OK, but pointing out racism is “playing the race card.” Poor white male right wingers blame poor non-whites and non-males for the injustices rich white males commit. Right wingers support the policies which comprise class warfare, but whine when anyone demonstrates the injustice of robbing the needy to enrich the greedy. Poor and working class right wingers believe increasing their taxes makes them richer, if Enron and Bill Gates get huge tax cuts. Right wingers support theocracy and fascism — actually craving a unified authority over their lives and even their afterlives! They support censorship. They want to impose their religious views on everyone. They want to punish anyone who strays from the fold. They brutally suppress anyone who questions authority, and they always obey abusive controllers. They are afraid of their own freedom. They are even more afraid of yours. A ‘live and let live’ attitude toward adherents of Judaism, Christianity and Islam just isn’t possible anymore given the weapons of mass destruction they wield, and their intolerance so inherent within each of their respective religions producing such continal systemic violence. All unbiased freethinkers, or those using reason without regard to authority to guide their lives, regardless of nomenclature as non-theists, atheists, agnostics, non-believers, secularists, rationalists, progressives, or humanists, are urged to rationally confront, challenge, and attack the collective pandemic and psychotic faith-based virus of the mind threatening us all. Confront, challenge and attack the faith-based, right wing authoritarian personalities by first understanding their origins, fallacies, hostilities, character flaws and blindness to their own psychosis. I'll leave my rantings here on the RWA personality disorder today and you all with links to the latest book from the modern day esteemed expert on the RWA personality, Dr. Altemeyer. A book ultimately about the destruction of American democracy that he graciously makes availabe on-line for FREE! If there was a God, Man wouldn't have had to invent him [reversing Voltaire's famous quote]. Wow - great post. It illustrates so many of the less visible problems of religiosity and why people afflicted with it are unable to recognize what's going on. Well thx Vorax, but I'm especially pleased you'd found that article about Gregory Paul's study and mentioned it here at RR. An article about this sociological study that not so coincidentally didn't bare even a mention in any of the corporatist mass media for this most dysfunctional Christian country in the entire world. It's not like I wrote it all just for RR - I copy-pasted much of it from an article I've been working on, like forever it seems, to send to a 'freethought' periodical that has published some of my other anti-religious, anti-faith, anti-NeoCon [same as Anti-NeoFascist] or anti-God's Own Party [GOP] rantings. You guys noticed the date on this, right? 2005 was when it was first published. I wrote an essay on this at least a year ago, and received remarkably little feedback. I'm not a professional sociologist, but I am pretty well versed, and I read the full study. The methodology is good. The conclusions follow from the data. This is just one more proof that Proof has never gotten in the way of Opinion. Keep plugging away, folks. Eventually, the evidence will be so overwhelming that something will happen. Good, bad, I dunno. But god's getting pushed pretty far into the corner, and he gets pissed when you insult his followers. Adnihilo, did you say you have posted this article elsewhere? If so then I'd like the url. I can see this as being a great article to link people to. I'm ok with that, but I'll go ahead and tell you the results. Liberal denominations are going to be a little worse than non-theists and atheists, and there's going to be a more or less direct line going straight up the chart, corresponding to degree of adherence to the holy text, until it skyrockets when you hit fundamentalism. The data will bear out that non-theism is best, but really wishy-washy liberal theism isn't too bad. Are you going to be happy with that result? Did you cite sociological statistical studies though in your essay? I suspect many 'non believers' theorize the problem with violence in America stems from so many in its populace fostering devout Christian beliefs. The statistics Gregory Paul accumulated are what make his conclusions as a social scientist so relevant in his study... Like you say, his Phd background as a social scientist surely gives him the credence as well as the more technical abilities many will not have without such a background..
Adnihilo, did you say you have posted this article elsewhere? If so then I'd like the url. I can see this as being a great article to link people to. Nah, it's not posted anywhere else - it's just something I've been working informally on, joting down notes and posting parts here and there as it has coalesced in my head over the years since Bushitler and his cabel of criminal conspirators first 'took' office in 2001. Like many opposed to the Bushies and their religious fanaticism, I saw what I concluded as cult thinking in God's Own Party [GOP]. I wondered where it stemmed from and initially posted something I wrote back in 2002 called "Plato vs. Aristotle: Plato's Dualism as the beginnings of monotheism" on of all places the old A&E History Channel's 'Religious Forum'. Being mostly devout Christians there, they brutally attacked me from all sides for that one! I'd studied personality theory and types in my MBA speciality in Career and Human Resource Development, so already had a strong interest in the RWA personality type I now identify to be just as much a 'disorder' as a type. So I've read as much as I can find on it, although have yet to read John Dean's book Conservatives Without Conscience". I've read all about it, but just haven't read it yet from learning I'm better off just reading Altemeyer's articles and books. You'll find Dean's book almost solely based on Altemeyer's studies though who talks about Dean as being a close friend of his in his own new book 'The Authoritarians' on the above pdf links. In the few interviews I've seen of John Dean promoting his new book, I've yet to hear him once 'identify' the full and 'correct' name for this 'largely unknown 50 year academic study' he uses as the predominant thesis for his new book. Whenever referring to what he correctly calls a 'massive study', Dean conveniently and seemingly by intention, leaves out the full name for this behavioral science research. In both Dean's Daily Show and Countdown interviews, the self-proclaimed Goldwater Conservative can only bring himself to identify this half century of behavioral science research as the study of the 'authoritarian personality' instead of identifying its more complete name as the study of the 'Right Wing Authoritarian' [RWA] personality. This half century of study Dean refers to as solely 'authoritarian' includes 'right wing' out of necessity, because 'left wing' personalities, by their very nature are rarely, if ever identified as 'authoritarian'. So much so, that the behavioral scientists specializing in the psychometric field of personality identification by necessity had to give this personality type the specific acronym of RWA that includes 'right wing' as the sole political ideology for the 'authoritarian' personality. In other words, a right wing ideology is considered to be representative of the 'authoritarian personality' [AP] by unbiased and non partisan behavioral scientists. The basic thesis for Dean's book presents the Right Wing Authoritarian [RWA] personality as responsible for something 'rotten in the state of conservatism' today. Dean notes that our present day new [neocon] conservative [republican] politicians have regressed to their authoritarian roots. He draws on a half century of behavioral science research into the RWA personality [without reference] that specifically identifies Altemeyer's 'double high' RWA personality type as self-righteous, mean-spirited, amoral, manipulative, and bullying. Dean then refers to what is called the RWA submissive personality type by specifying "23% of the populace falls into the follower category". Although correctly referring to RWA types as exuding traits of either a predominantly aggressive or submissive personality, Dean doesn't seem to reference a source for his '23%' figure for RWA followers in his interviews on the book. Nor could I find any reference to this '23%' figure in a host of RWA personality studies I've accumulated. Dean also consitently failed in his interviews to give a per capita percentage for RWA 'double highs' in the population. Nor could I find any reference that estimates what percent both RWA aggressive and submissive personality types combined make up in the total population. In protecting what seems to be his own image of himself as a 'Goldwater' conservative, Dean of course invokes the RWA personality disorder to villify only today's neocon flock of RWA 'double highs' as regressing to their authoritarian roots. The RWA personality however doesn't 'regress' to Dean's 'authoritarian roots'. Psychometric testing tools identify whether or not the individual is a RWA personality type, and if that RWA personality type is RWA 'aggressive' or RWA 'submissive'. Over his many years studying this personality, Altemeyer found RWA personalities to exude a high statistical trait correlation or tendency to display certain characteristics he organized into four general categories. Common RWA traits the victims of unreasoning right wing wrath and hate will easily recognize from: faulty reasoning; hostility toward outgroups; profound character flaws [dogmatic, zealots, hypocrites & bullies] and lastly; a blindness to one’s own failings. There is also emerging evidence that RWA 'aggressives' and especially the highly aggressive 'double highs' exude a cluster of sociopathic and psychopathic traits frequently found in religious, cult, corporate and political leaders. Dean does identify Christian political leaders like Pat Robertson and Tom DeLay as textbook examples of Altemeyer's 'double high' category of RWA aggressives. Many behavioral scientists, including Adorno and Altemeyer, present RWA traits that identify these personalities as the root cause of dictatorships, terrorism, fascism, cults, torture, and a multitude of the world’s societal ills. Personally, after reading 100s of pages in research into RWA traits, and easily being able to identify all the 'double highs' in the Bush Admin., as I mentioned I find this highly aggressive level in the RWA to be more than just a personality 'type,' but a personality DISORDER. Read a free on-line book called 'Mask of Sanity'by Hervey M. Cleckley for a better understanding of psychopathic traits. It is a classic study of psychopaths where the author refers to the authoritarian father figure as 'common in the early background of the psychopath'. John Dean's forte, as readily seen on his expansive findlaw.com web site, is of course law, not behavioral science. Although Dean can be commended for introducing the RWA personality to the unknowing masses, he doesn't explain its primary Platonic and secondary Christian origins. As far as I know, even Adorno and Altemeyer, the primary behavioral scientists identifying and studying the RWA personality type, only correlated the RWA personality traits to their secondary Christian origins, not their primary Platonic origins. So in my never ending quest to understand the seemingly less than human 'dependent and unreasoning mind' represented in 'The True Believer' proposed by Eric Hoffer, I attempt to trace that half century of RWA Personality behavioral science research back to its hellinistic beginnnings found in that age old argument between the life philosophies of Aristotle and Plato. Ultimately in an article yet to published or posted anywhere that hopefully clarifies RWA cults, right wing ideology and political parties, right wing fascism, and the Christian religion as all having their origins found, and basis in Plato's philosophy of life. A 'true believer' faith-based life philosophy that is the antithesis to Aristotle's rational based one. I did cite some studies, although I wasn't going for a scholarly audience, so I kept it to a minimum. I notice you refer to Altmeyer. It was shortly after reading his work on RWA that I began to put all the pieces together and understand with some clarity how religion and authoritarianism work together, and why they're such a good match. I've been trying to get other people to read that book, but few people are willing to wade through a real scientist's book, even if it's not that difficult a read. It's such a groundbreaking work, though. I'm really excited about some future attempt at putting RWA, religiosity and social ills/violence/etc together and getting a real correlation. Better off without citing statistical studies but merely referring to them to relay a rational conclusion in catering to the largest audience. Reading Greg Paul's sociological study can be drab and boring as much as it is sifting thru the more scholarly studies from behavioral scientists on the RWA personality. You're to be commended, as anyone should be for at least attempting to help folks understand the pervasive religious psychosis affecting and infecting billions in the world today.. The crux to solving this monotheistic 'mind virus' begins first in helping non believers understand and comprehend what causes this religious psychosis [or virus of the mind] and the type of RWA personality it creates in order to cure it on a global level . It's happening to a stronger degree now more than ever before throughout Europe and especially in France from atheists taking on a more assertive position and role, just like RR does in the media and of course here... A new age of enlightenment may come afterall before I end up dead ... I think the religious right taking control of America thru Bush-GOP actions since the start of the 21st century has actually helped push the world towards this new age of enlightenment [referring to the first 'deist' original enlightenment from Europe in 17th century]. Just a quick comment. I do think religions have contributed to better societies... no more or less than laws, government, free trade or technology has done, though. Generally the concept of religion itself is as inherently neutral as any organised circle of human thought, and as different in practice just the same. But on specifics I really don't think that contemporary popular christianity has the grounds for those particular claims at all. I do think that in the past, when knowledge of the natural world was so limited, it may have helped in some way to think the boogey man was gonna getcha if you didn't conform. no more or less than laws, government, free trade or technology has done, though. Definetly less in my opinion. The benefits of laws, government, free trade and technology are substantial. They have helped with general saftey, prosperity, communications, personal rights, standard of living and length of life.... all substantial. It is natural, and as I said, may have been beneficial in the past, but there is very little evidence it has any benefit in todays society...and as the study shows, it actually appears to have adverse effects. These are all fundamental components of modern christianity that are flawed and it makes perfect sense to me that they will lead to societal problems. Even from a high level they are destructive, but the particulars are even worse. Tie people down with unatural expectations and they will rebel. The fundamentals of christianity are unatural. Oh you misunderstand. I literally meant modern christianity can't claim what they are claiming. You get no argument from me on that topic.